Water jet vacuum units TOM-JET-1, the universal vacuum sources for your applications. By means of an electric circulation pump, water is pumped through two (A2/K2) alternatively four (A4/K4) optimized water jet pumps (glass). The circulation pump is a multi stage pump, designed for constant pressure and long running time. Low water consumption and excellent final vacuum are the features of these vacuum pumps. Sucked in vapors do not influence the vacuum values. 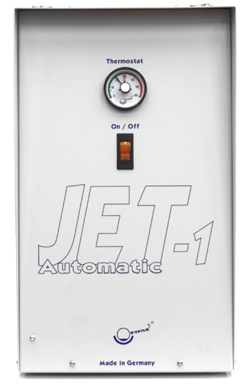 The saving of water of the water jet vacuum units TOM-JET-1/K2 and TOM-JET-1/K4 is nearly 100 %. These systems contain a heat exchanger with thermostat. The cooling can be made by a chiller.